This Buffalo chicken dip is made with cream cheese, ranch, chicken, and Frank’s Red Hot Buffalo sauce. Perfect for the game-day party! For me, this time of year is all about yummy appetizers! We just celebrated New Years and we’ve got the Superbowl and some other big sports games coming up and all of these events are made even more fun when accompanied by some fun appetizers! 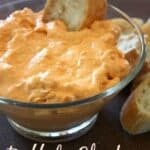 I LOVE this buffalo chicken dip! It’s tangy and has a bit of a “bite” to it (but it’s not too hot). We love this served with some yummy crusty bread cubes, crackers and celery sticks! 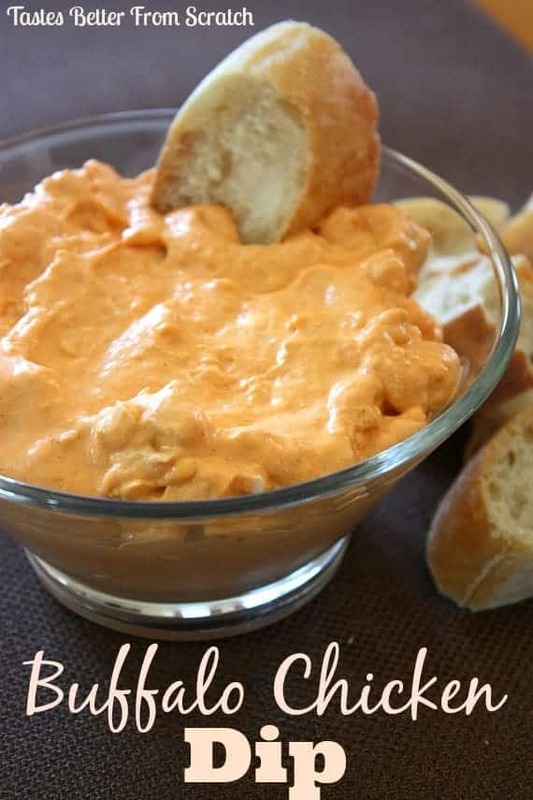 This Buffalo chicken dip is made with cream cheese, ranch, chicken, and Frank's Red Hot Buffalo sauce. Perfect for the game-day party! Place cooked chicken and the Franks hot sauce in a large skillet over medium heat. Stir and heat until warm. Stir in cream cheese and ranch dressing. Cook, stirring until well blended, hot and bubbly. Serve with crusty bread, celery sticks, crackers, pita bread or whatever you'd like to dip in it. This sounds so good! Definitely need to make some, thanks for sharing your recipe! I use a rotisserie chicken (one per 8 oz cream cheese) that you can get cooked already in the deli section of your grocery or even Walmart. It adds another dimension of flavor and really breaks up well to give the dip a great texture. Just get the chicken(s) and allow to cool then pull the meat off the bones! I also toss in a handful of shredded cheddar cheese. This is a huge hit among the kids and adults and I usually get request just about every weekend! We serve with tortilla chips. This was a BIG hit at our super bowl party!